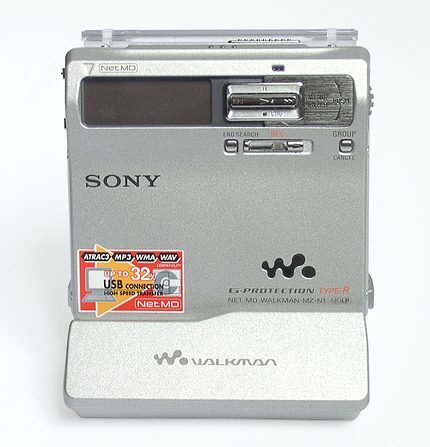 The MD technology was offered by SONY as a substitute for an analog compact cassette. First MD players released in 1992 didn't find the market acceptance. Equipment of the MD standard was first used primarily in professional studios and on concert scenes for recording phonograms of concerts and performances. SONY, the developer of the MD standard and major developers of such equipment, followed the wait-and-see policy, and in several years it managed to improve the technology considerably. The most complains about the MD were related with sound quality: in the early 90s the chips coding sound by the ATRAC algorithm couldn't cope with their functions well, and the sound produced was rather rough. But then the MD devices got new DSPs that processed sound in a real time mode using the floating-point calculation, consumed quite little energy and sounded much better. In the late 90s most mini systems of the upper price category had MD decks built in. New portable MD players of SONY - MZ-R90 and MZ-R70 became popular thanks to their featherweight, long run-down time and luxurious capabilities for that time: recording from a microphone, line and digital inputs. The sound quality of the new models didn't yield to that of most portable CD players. However, it was impossible to copy data from mini discs in a digital mode and audio data could be rewritten only in the real time mode, like on a good old compact cassette. 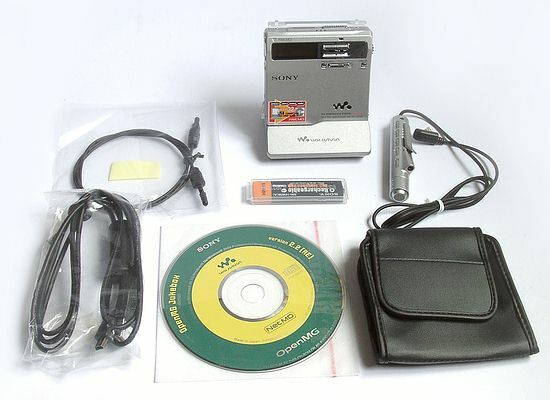 Finally, the new SONY's line released in 2002 acquired the support of NetMD technology that allowed recording audio onto minidiscs via USB at up to 32x (compared with traditional MD devices). A minidisc (MD) is covered with a protective shield like a diskette, which makes it more protected from mechanical damages. Recording and reading are implemented by a single laser head on magneto-optical discs with a laser wavelength of 790nm. Sound is recorded onto a MD according to the ATRAC algorithm similar to the MP3 method: redundant sound information is sifted out. Many assume that the compression quality of players of the latest generation is better than the MP3. One disc can house 74 or 80 minutes of audio data. The TOC zone (Table Of Contents) stores data on track addresses (like in FAT). In most modern players it takes almost no time to search for tracks. The new players also support the MDLP function which can record sound at the greater compression degree (obviously at the expense of a lower bitrate). The LP2 mode allows recording twice as much music (148 minutes onto 74-minute discs and 160 minutes onto 80-minutes ones), and the LP4 allows increasing the size four times (296 and 320 minutes respectively). The mono record mode is supported as well. In spite of moving parts it's almost impossible to break playback by shaking a modern player. An MD player is not too far behind MP3 models in this respect. One MD can endure 5000 rewriting cycles on average. Its price hovers around 1.5-3$. Well, there is everything you might need when working with the player, except a blank minidisc (it comes only in the American version of the package). The cradle is actually a new accessory for SONY's MD players. It's made of firm plastic and has a massive base with sticky rubber legs. A USB cable and a network adapter are to be connected to the cradle. screw fastening and two pins for an external module with a battery of AA format. Note that the player can get power both from a flat rechargeable battery or an external one as there is a module housing an AA battery which can be screwed to the player. Although the figures are different, the result is still satisfactory. Note that we recorded with the microphone which probably got the phantom power supply. With the line-in the scores might be better. Like all top models of SONY's MD players the MZ-N1 has as least controls as possible. The Jog-Dial located on the side panel is used for navigating the menu. On the other side there is a volume control Vol+/Vol-. Under the screen you can see END SEARCH buttons (end of the last recorded track), a RECORD slider and a GROUP button (which enables/disables group playback mode). The T MARK button sets marks of track ends for playback and recording. Playback can be controlled with a rectangular joystick located next to the screen. To get a previous or next track press its right or left sides, to stop or pause press it up or down, and to start playing press in the center. The dial is however not handy at all - it's very tough to press and often does not what I ask it to do. In the cheaper models SONY MZ-N700 and MZ-N505 the management is much mroe convenient. The display can show up to three lines. In the playback mode you can see a track's name, time and a signal's level. The tree-coded menu is not complicated; and I found abundance of functions really striking at first. You can adjust almost everything starting from screen contrast to modes of the graphics equalizer and mic sensitivity. With the jog-dial navigation is fast and simple. In the playback mode the jog-dial lets you jump from track to track or from group to group. You can make separate settings for every MD, for example, sound parameters, playback programs etc. The remote control has a backlit screen. With this device you can access all settings of the player via the same branchy menu. The remote control uses a very interesting approach for playing music. There is a dial on its side which, when turned, starts a previous or next track. The Stop button is separate. The dial must be pushed forward to control volume. But I don't find such a solution convenient as you can hardly use one hand to control the player. The matter is that the dial is quite tough and it's not simple to turn it with one hand when the remote control is fastened to your dress. That is why you have to hold it with the other hand. In the controls of the previous generation and in the inexpensive NetMD player (Sony MZ-N505) the remote control without a display was much more user-friendly. In short, inexpensive NetMD players have management implemented much better. 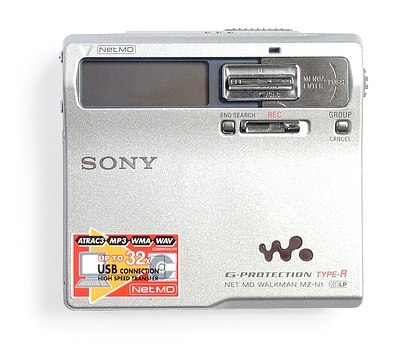 The Sony MZ-N1 uses a DSP chip of the latest generation ATRAC DSP Type-R which, according to Sony, is installed in high-quality stationary MD decks. The Type-R mode can be enabled only in case of recording in the SP mode (standard) and only via optical/line inputs. We listened to the player using the professional headphones Sennheiser HD200 - the player is powerful enough to use them to their full capacity. It's important that the new line of SONY's MD players is able to produce sound much louder than the previous generations. This is obviously on the account of new amplifiers of the class D used by SONY in modern portable devices. You can perfectly hear the music in noisy places like metro. The headphones are not labeled, though I must say that they are not bad at all: although bass is almost lacking, they are well matched with the player. They have a noticeable peak in the upper middle range, which, in combination with a sharp character of the player, sounds rather harmoniously. However, I think that the MZ-N1 sounds sharper and even coarser as compared with the previous models. But it might be caused by the DACs instead of the new Type-R chips. The characteristics of the DACs were estimated with the RMAA program. 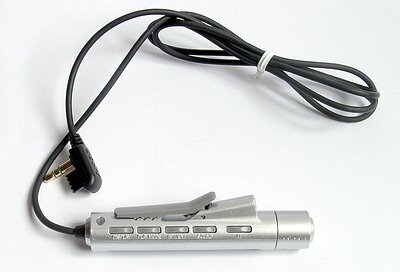 The input signal from the professional Audiotrak Maya44 sound card was applied to the played via the optical cable in the digital mode, and was then sent from the player's output in the LineOut mode back to the Maya44. The characteristics of the analog section of the SONY MZ-N1 are quite decent. The player can boast a very low noise level and a considerable dynamic range. The slump in the LF range is probably caused by the blanking circuit for unltralow frequencies used to reduce energy consumption. By the way, in the Sony MZ-N1, in contrast to the previous models, when a signal is applied and measured in the real time mode the signal applied to the output is uncompressed. The sound is thus monitored "as is", without ATRAC compression. That is why we had the chance to test quality of the converters. Old models applied ATRAC packed sound directly to the output. Here we are coming to the most interesting feature. What's the idea of the NetMD technology? Right after connection a new device was detected (NetMD). The drivers were installed without problems. The OpenMG Jukebox was installed first. OpenMG is powerful jukebox software that supports grabbing from audio discs, playback of WAV/MP3/WMA/ASF tracks and playback of different playlists. The program can fully control the MD player when it's connected via USB and record audio files on a mini disc. Note that the existent NetMD players CANNOT rewrite tracks from discs onto computer via USB. 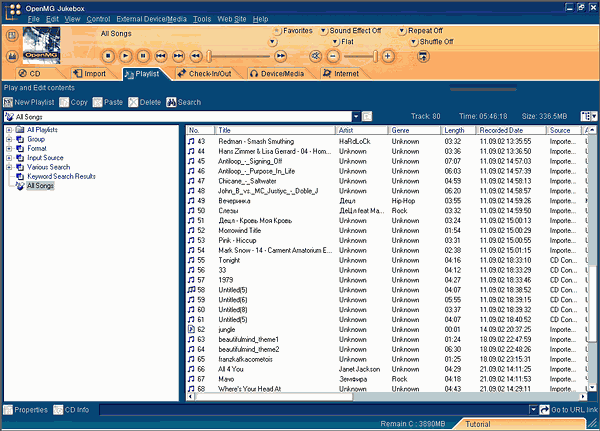 The OpenMG reads the contents of an MD in the player and gives out a list of tracks. You can rename, move, delete and play the tracks. Well, the developers did their best to give you a feeling that you are working simply with files. Tracks can be combined into groups, like into folders in MP3 players. You can record on an MD either WAV/MP3/WMA files or tracks from AudioCD; track names are imported onto MD directly from ID3 tags or names of files/tracks of CD. The principle of operation is following: you import selected files into the internal playlist of the OpenMG where the files are packed according to the ATRAC algorithm in the selected mode (SP, LP2, LP4). MP3/WMA are surely not written directly onto MD, and compressed MP3 files go through one more compression stage by means of the ATRAC algorithm. But such double compression is not so terrible as it might seem at first. First of all, when music is directly recorded (via line-out of a sound card) the sound is affected by imperfect converters of the card and the player, in addition to the ATRAC. If you deliver tracks via an optical cable the sound will still be ATRAC compressed. In the SP/LP2 modes this algorithm doesn't bring in noticeable artifacts, contrary to MP3. ATRAC files have softer sound, lack some details - but only in the LP2/LP4 modes. That is why the double buffering is not so terrible as it might seem. But traces of the double buffering can be noticed in case of MP3 files of a low bitrate (<128 Kbit/s). At such a low bitrate a lot of frequencies determined by the MP3 codec are cut off. The ATRAC algorithm has its own preferences and cuts off other frequency bands - the record quality can be thus even worse on the MD than on the original MP3. So, let's take ten MP3 files of 192kbps and pump them into the player. The speeds via USB claimed by SONY are 1.6X for SP, 16X for LP2 and 32x for LP4. First let's try to rewrite the files in the SP mode. First of all the files are converted. Converted files are stored in a special format in the OpenMG folder, so that next time they won't be converted again. In the beginning of recording the lamp "RECORD" will blink and the display will show a record time. It takes 2 minutes to record a file of 3:01, which means that the speed equals 1.5X. It's not much, but it's very close to the claimed parameters. In the LP2 mode the same file was recorded at 10 seconds. It's really fast. So, the speed is 18X. At last, the LP4 mode. The file was recorded at exactly 6 seconds, which equals 30X. Now let's try to rewrite an Audio CD with the OpenMG. Austin Powers 2: The Spy Who Shagged Me OST, 42:28. LP2 mode. The OpenMG took a very wise approach: while the first grabbed track was recorded onto the MD, the second one was sampled. It saves a lot of time. And it took only 3.5 minutes to record the AudioCD onto the MD. By the way, before grabbing the OpenMG downloaded CD tracks' names from the Internet which were then compiled onto a minidisc. The OpenMG sports the advanced protection technologies. You can fulfill not more than 3 check-outs (record files on minidiscs), i.e. one song can be kept on only 3 different MDs. You can also check in tracks, i.e. delete a track from MD and write in on another disc. Well, one would hardly keep the same compositions on more than 3 discs. Besides, it's always possible to copy files under different names... But there are a lot of other problems. First, tracks recorded with the OpenMG cannot be deleted directly from the player - you must connect it to the cradle and implement the operation in the program. There can be nonstandard situations: the system fails or files on the hard disc get damaged. In this case you can do nothing with your MDs until you reinstall the program. And what if you lose MDs? You won't be able to check in them, and the files would be impossible to rewrite. The NetMD justified the hopes completely. But the fighters for the rights of record companies left an unpleasant traces: the protection is not good enough, and it's impossible to record audio in the digital mode from a mini disc into a computer. The MP3 players are unconquerable here. Today a player supporting the NetMD technology can be bought at $200, which is not much compared to MP3 players with flash memory. 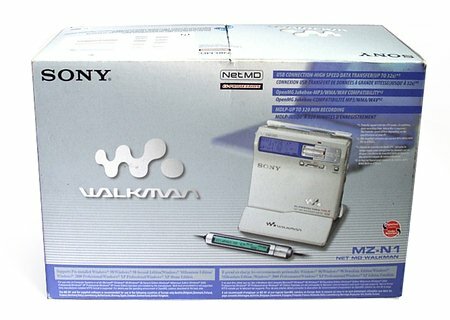 It's obvious that the price/quality ratio of the cheaper NetMD players of SONY is higher than that of the MZ-N1 model. In all other respects, this is a very successful device.